Shopping Milan | G. Lorenzi | A Continuous Lean. The one shop that really stood out to me in Milan didn’t have any fine Italian tailoring in sight, it was all about the knives. Founded in 1929, G. Lorenzi is really like no other retail establishment I have ever been in, ever. 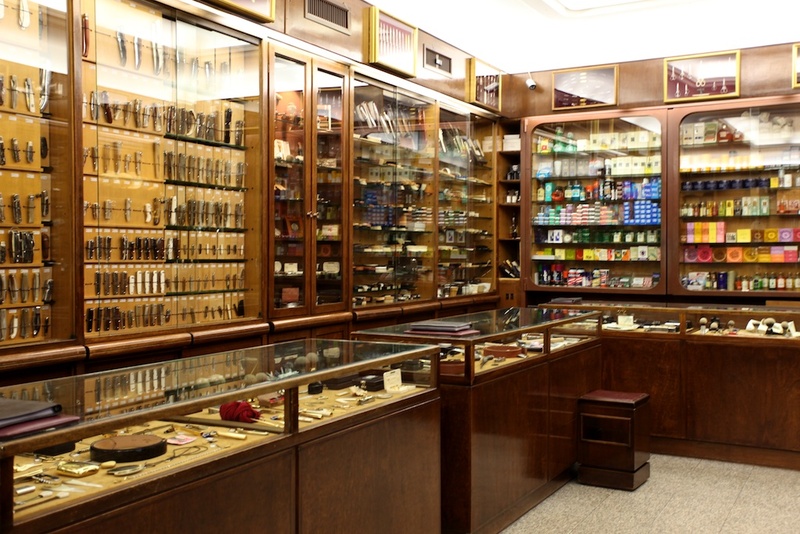 The walls are lined with dark wooden display cases which are very neatly organized with an array of all things man. 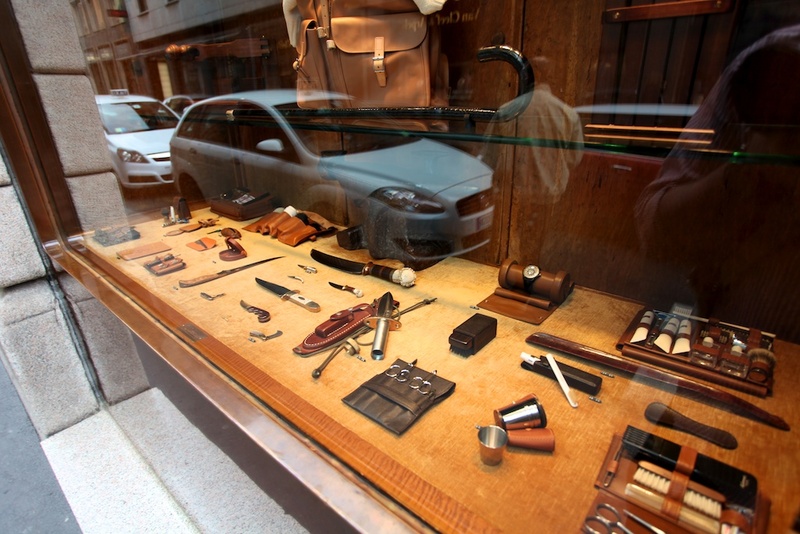 Knives, pipes, brushes, clippers, trimmers, shaving supplies, cologne, a huge selection of every possible type of scissors and basically every other little well made accoutrement you can think of. The obsessiveness of G. Lorenzi rivals some of the crazy stuff I have seen in Japan. And don’t get me wrong, the place is no C.O. Bigelow steroids, its roots are in knife sharpening and G. Lorenzi is above all famous for it’s cutlery. A logical pursuit given Italy’s obsession with food. My friend who helped orchestrated my trip to Italy marked G.Lorenzi as a must see and commented that the shop is as “ACL as it gets.” She couldn’t have been more on target. Guy Trebay even name dropped G. Lorenzi recently in his ode to Milano in The Times. I couldn’t agree more, the place is no joke. Next time you are in Milan, be sure to stop in if only for a peek and the perfect pair of scissors. Incredible. Can’t believe I missed out on this while I was in Milano last month. I have been following your website for quite some time now and after seeing these photos I had to finally comment and tell you how much I envy you. Oh my sweet baby jesus. So what did you buy? It was one of the places I had down on my list; the duomo & Lorenzi. Bought a wonderful buffalo shoe horn that I use everyday. I’m returning to Milan in 10 days, I plan on returning just for a knife…but really any excuse to have a look. The most amazing thing is that what is on display is just a tiny portion…you see 10 shoe horns, ask about them and a assitant will show you the draws…there are another 90 there! G. Lorenzi is one of my all time favorite spots..! Nice Randall model 18 front and center in the window. Going to Italy for American cutlery! My husband bought a suit brush from Lorenzi probably 10 years ago and he never needs to dry clean. It’s the best way to preserve a suit. You wouldnt have happened to have seen a nice,good quality stilleto while you were there,would you? Can we get some people in here to argue about the price of knives? Seriously though, these look pretty cool. Would love to see any additional close up photos of personal favorites if you have any. Amazing place, i could stay hours inside! It is an amazing store but what’s more amazing is that they have two locations. One is in the heart of the montenapoleone shopping area (pictured) and the other is right on Corso Magenta. Both are great. The magenta location is also close to the Milan outlet of santa maria novella if you are looking for some interesting cologne. Hands down my favorite store in the world. I’ve picked up an ebony inlay cigar cutter, a toothpaste squeezer (a must-have) and other super-cool items that one can seemingly find there. Ask for Marcello who speaks perfect English and has a wry sense of humor. They have absolutely every type of cutting implement known to man. Ask to see the items. You will be amazed by the amount of stuff on the trays they pull out. 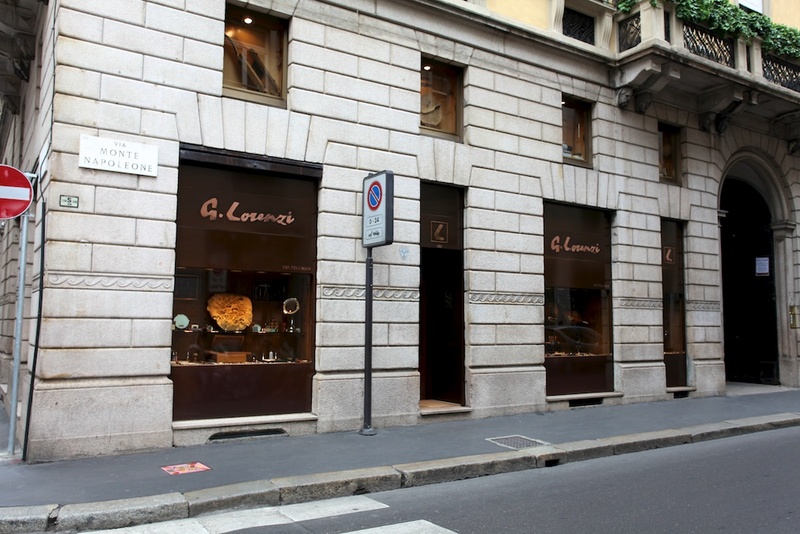 By the way, the shop on Corso Magenta is a separate branch of the same family and is called O. Lorenzi. Much smaller, but still run by the brothers. Very interesting to visit both to compare and contrast. Don’t forget to have an espresso and brioche steps away at Pasticceria Marchesi – the best in the city. This is an amazing shop. Can’t miss to buy something every time i pass by. This is my all time favorite shop in the world.I have been shopping there for 30 years.Everytime I go there I find something new to buy.It’s always a pleasure to spend time there with all the knowledgable people they have working in the shop.I have had the same salesman for many years.It’s like working with old family friends.Just an amazing place for anyone to spend time in.Just a joy .